Chinese President Xi Jinping on Friday morning held talks with Italian President Sergio Mattarella and the two sides agreed to firmly grasp the development direction of China-Italy relations from a strategic and long-term perspective and work together to push for greater development of a comprehensive strategic partnership in the new era. During the talks, Xi said the two sides should strengthen people-to-people and cultural exchanges, boost cooperation in culture, education, film and media and other fields. Mattarella said Italy supports the China-proposed Belt and Road Initiative, saying that the initiative is also a cultural exchange road. Italy is willing to strengthen its cooperation with China in culture and tourism. An Italian international high school that teaches science-related courses in Chinese might be one of the best examples of China and Italy's cooperation on culture and people-to-people exchanges. Opened in 2009, Rome Convitto Nazionale Vittorio Emanuele II has the largest Confucius Classroom in Italy. It is the first public scientific high school in Italy to include Putonghua as the first foreign language in its compulsory curriculum. The school has come under the spotlight on Chinese social media recently after Xi replied to a letter from students encouraging them to be cultural ambassadors between the two countries. When a Global Times reporter went to the school on Thursday, she was greeted by a group of elementary school students with hello in Putonghua when stepping into the teaching building. Photos and drawings with Chinese elements were seen everywhere in the classrooms and corridors, including those on the walls showing their memorable experiences in Beijing, which they call the "Beijing fairy tale" in Chinese. 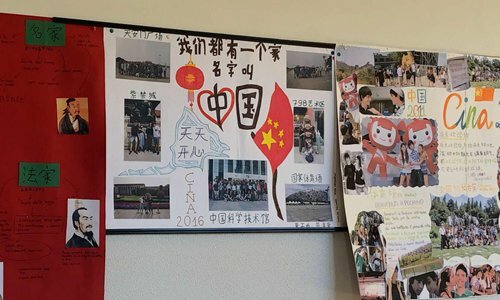 On a white board, some students posted their photos of Beijing's typical scenic spots and drawings of the Chinese national flag and red lanterns. In the middle of the board, they wrote "We have a family and its name is China" in Chinese characters. Other colorful posters introduce the Silk Road, Chinese food, kung fu, and the relationship between ancient Rome and China. 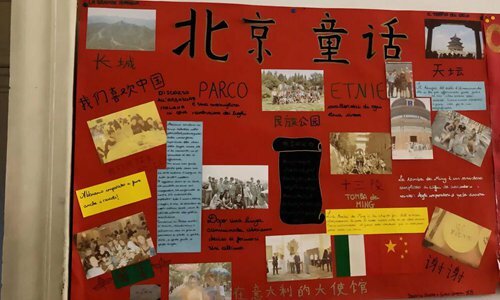 Yang Yan, a Chinese teacher who came to the school through an exchange program, told the Global Times that the posters, written in Italian and Chinese, were made by the students as the school not only teaches them Putonghua, but also Chinese history, culture and geography. Fiammetta De Angelis, an Italian bilingual teacher, said Italian students are especially keen on Chinese philosophy and participating in Chinese traditional festival. Walking into one of the classrooms, the Global Times reporter saw Italian and Chinese teachers were teaching the students at the same time. The Chinese teacher was asking them the geographical locations of major countries. The students answered the questions actively and correctly in fluent Putonghua with standard pronunciation. Chen Chen, a Chinese teacher who has been teaching for seven years at the school, told the Global Times that under the influence of learning Putonghua, more and more students are preferring to choose Chinese universities instead of local or Western schools. Chen shared that a student once went to Shanghai and was shocked by the city's maglev train. After he came back, he made a maglev train model and illustrated the train in his oral test. "He told us that learning Putonghua helped him open the door to know about the world and he then decided to pursue his undergraduate study in a university in Shanghai," according to Chen. The school's Confucius Classroom was established by the Confucius Institute of Sapienza University of Rome. Zhang Hong, Chinese director of the institute, told the Global Times that an selective course in Putonghua was also opened for elementary and middle school students as they have great passion for Chinese culture. "For high-school students, learning Putonghua is not only for communication, more importantly, it has been integrated into the study of science courses such as engineering and medical science. To improve their spoken Chinese and cultural cognition, the school sends them to China for summer camps every year," Zhang said. Since 2006, 12 Confucius Institutes and nearly 40 Confucius Classrooms have been established in Italy, more than 100 Italian primary and secondary schools have opened Chinese courses, and the Chinese language has become a major in more than 40 Italian universities, the Xinhua News Agency reported. "Italians are fond of Chinese culture and the connection has profound history. 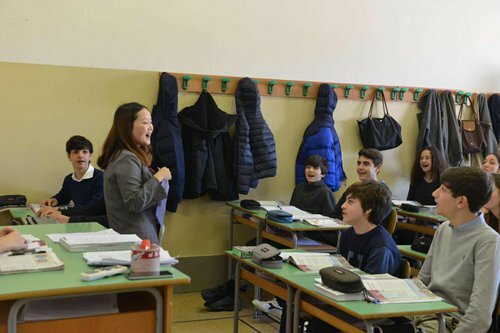 Italian schools hope to cultivate the international skills of students with cross-culture backgrounds through Confucius Institutes," Zhang said. President Xi's visit to Italy will add fuel to the Putonghua fever in Italy and help reinforce public support for further deepening political ties between the two countries, Chinese Ambassador to Italy Li Ruiyu was quoted by Xinhua as saying.